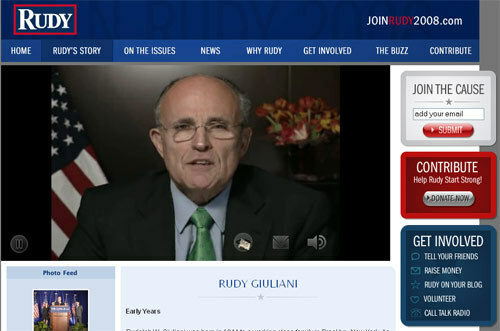 Today, Rudy Giuliani launched his Internet video campaign with Brightcove, http://www.joinrudy2008.com/videos/. Over the coming weeks and months, the Giuliani campaign will be rolling out a number of new Internet video offerings and syndication opportunities for supporters to feature high-quality campaign videos on community websites, blogs and MySpace pages. This is a tipping point year for Internet video in politics. We are thrilled that leading presidential contendors have partnered with Brightcove for direct-to-voter campaign communications.